Requirements were INTRODUCED as a new merit badge effective June 13, 2012. This merit badge can be earned concurrently with the Kayaking BSA Award but earning one does not automatically qualify the Scout as earning the other. The Worksheets below contain contain information on, and can be used for, either or both the Kayaking Merit Badge and the Kayaking BSA award, and indicate which requirements correspond in whole or in part to requirements for the other award. Note that the above statement supersedes the crossed out statement in red italics below, which was taken from the merit badge pamphlet. While Kayaking merit badge counselors may have formal training in kayaking and paddle craft instruction, it is not required. The objective is to have standard qualifications for merit badge counselors. The Boy Scouts of America's risk management plans call for certain qualifications for particular activities, such as those on the water. However, merit badge counselors have the option of achieving those qualifications for themselves, or, when those activities are taking place, they may use the services of others so qualified. It is permissible for councils to "raise the bar" and approve only those counselors who meet certain qualifications - but this is strictly a council-based decision. It is also permissible, of course, for the National Council or a local council to establish standards for camps or events offering merit badges that include activities requiring special qualifications. Kayaking instruction should follow the information and techniques presented in this pamphlet. Supplemental information and additional strokes should not be introduced until the basic requirements are met. 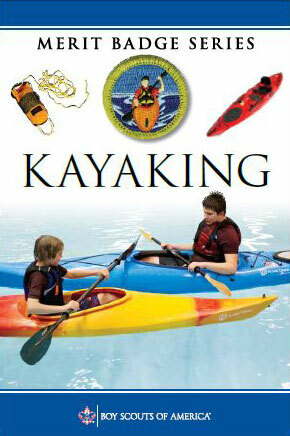 The learning objectives emphasize safety and basic skills proficiency for solo kayaking. Participants in kayaking instruction should understand and appreciate the limits of their ability and experience. It is the merit badge counselor’s responsibility to follow all BSA safety policies, especially the nine points of Safety Afloat. Although earning the Kayaking merit badge can help prepare a Scout for paddling on moving water, it does not constitute the special training required to participate in a whitewater activity. This merit badge can be earned concurrently with the Kayaking BSA Award but earning one does not automatically qualify the Scout as earning the other. This merit badge should be taught on quiet water without significant wind, waves, or current. The boats should be hard-shell kayaks with large, open cockpits from which the Scout can easily perform a wet exit, or they should be sit-on-tops or inflatable crafts. The boats should preferably be solo boats, and all testing should be done with the Scout as a solo paddler. A kayak with a spray skirt should be permitted only when the Scout has had prior kayak training and is able to perform a wet exit with a skirt to the counselor's satisfaction.